That time is quickly approaching. With the release of the PlayStation 4 set for late 2013, people are gearing up for the switchover to the new console from its predecessor. Still, even at its (significantly lower than the PS3 at launch) price tag, $400 is not exactly an investment many of us can make at the drop of a hat – especially when the PS3 is still very much a viable console. In an interview with Weekly Famitsu, Sony Japan prez Hiroshi Kawano and his counterpart at Sony Worldwide, Shuhei Yoshida, addressed the issue of PS3 support after the PS4 release. "It's been seven years since the release of the PS3 and the console continues to sell at a constant pace, plus we have many upcoming titles." Kawano said. 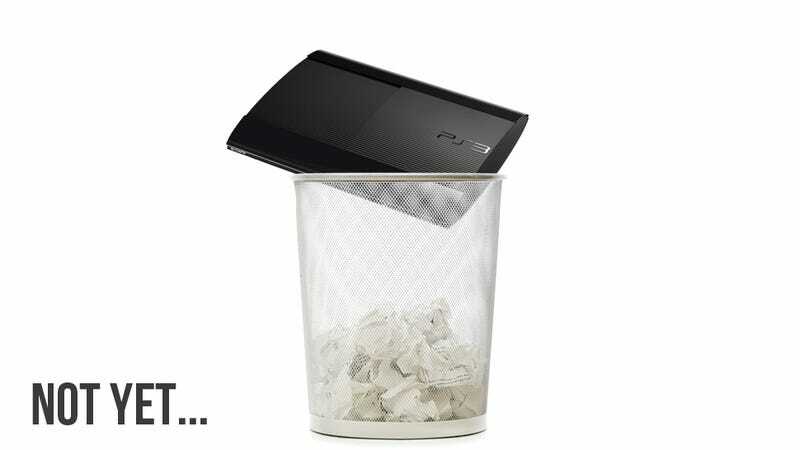 "We have no intention of immediately shifting from the PS3 to the PS4." "...to say 'we're releasing a new console, so trade in your old ones for it' would be a maker's ego talking, plain and simple." This is not exactly a new strategy for Sony: Support for the PS2 continued long after the release of the PS3. Nevertheless it's definitely reassuring to hear it directly from the people in charge. Said Kawano, "With the 2014 launch of our cloud service in the US allowing users to play PS3 games on the PS4, some people may switch consoles from the PS3 to the PS4. But that'll be a gradual process, and to say 'we're releasing a new console, so trade in your old ones for it' would be a maker's ego talking, plain and simple." In regards to the news that a PlayStation Plus subscription would be mandatory for online play, Yoshida smoothed over the criticism that Sony would be charging for a service they had, up until now, been offering for free. "The main pillar for the PS4 will be online play. We're developing many new ways to play and connect which requires a large investment of resources." Yoshida explained. "Considering the cost, to try to keep such a service free and consequently lower the quality would be absurd. We decided that if that's the case, then it would be better to receive proper payment and continue to offer a good service." Yoshida clarified that a PlayStation Plus account would be required for "realtime online play" but that online play or video services that weren't "realtime" would be available for non-PS Plus customers. He also added that so long as the main account on a console had a subscription, all other accounts on that console would be able to reap the benefits of PS Plus. In closing, Yoshida reiterated Sony's stance that the PS4 would play used games and gamers could freely trade, share, and sell their used game discs. He did note that while the PS4 would not be region-locked, in order to fully utilize all services, it is suggested that gamers purchase their consoles and games in the regions they are sold.